1. The Harry Potter series. Maybe it’s always been like this, I don’t know, but it seems the “thing” these days is to write YA series(es?) rather than standalone novels. Which is fine, I have no beef with that. But with all these new trilogies coming out, please don’t forget about Harry Potter. You know he’s the best. Yes, I’m biased because I’m smack in the middle of the “Harry” generation—I was 10 or 11 when I first read Sorcerer’s Stone and was 17 the summer that Deathly Hallows came out—so I truly did grow up with Harry, but the series is just so wonderful. Long live Harry Potter! 2. Ender’s Game. This one has some emotional ties for me (it was recommended to me by an older cousin who is sort of my idol) but it’s also just a great book. In the wake of all the new fantasy stuff coming out, don’t forget about good old science fiction! 3. Pride and Prejudice. The ultimate romance novel (if just a little too perfect). Who wouldn’t want to have a Mr. Darcy in her life? Although, you know, the second-half-of-the-book Mr. Darcy, not the one who looks down his nose at you because you’re not pretty enough to “tempt” him. So, you know, when you’re heading out to buy that new Danielle Steel novel, just remember who was there first. 4. The Narnia series. What a great children’s series with great morals. I can’t wait to buy a set of these for my younger brother and sister (currently ages 3 and 4, so I’ll have to wait a few years) and eventually for my own kids! I didn’t actually read them until earlier this year, but I loved them and I’m so bummed I wasn’t interested when I was younger! If only I had known how much 22-year-old me would love a bunch of kids’ books! 5. The Little House series. Again, a series I loved growing up that had some great—if slightly outdated—morals. Another box set I can’t wait to buy for my little sister! 6. The Baby Sitters series. Yes, another series from my childhood. This is one I definitely couldn’t buy a boxed set of since there were hundreds of them, but how could anyone who grew up in my generation ever forget about Kristy, Mary Ann, Claudia, and Stacey? I totally miss reading these sometimes, and I hope no one ever forgets about them! 7. Nancy Drew. The original “I can do anything I put my mind to” girl! Geez, she really could do everything, couldn’t she? And she was instantly amazing at anything she tried, and all the boys loved her, PLUS she was a freakin’ genius. I totally wanted to be Nancy Drew when I was younger, even though I’m pretty sure I recognized even them just how unrealistic everything about her was. Occasionally I’ll forget about Nancy Drew just to be reminded again and wonder where I can re-purchase those books (since I think I gave mine away a long time ago). 8. The Elements of Style. Okay, this is kind of weird, yes, but as I’ve recently begun doing some informal copyediting for a friend’s tech blog, one piece of advice from The Elements of Style keeps clanging in my head: “Omit needless words.” I’m guilty of using needless words for sure, but I can’t tell you how many times I’ve had to downsize crazy-long run-on sentences to literally one simple sentence. Makes me NUTS. 9. 1984. It’s not the first dystopian novel ever written and it won’t be the last, but it’s one of the best I’ve ever read. If you’ve never read it, you definitely should. 10. Any book that YOU love. I’m serious about this, guys. If you love a book, never let it go. Don’t let people shame you for finding that one (or two, or however many) book(s) that you love to reread and can always turn to when you need to escape or need to feel better or just need something to read on a train. Don’t forget about the books that meant so much to you when you were a kid, or a teenager, or even an adult. Different books speak to us at different points in our lives, and rereading them can sometimes catapult us back to when we were sixteen and first read that one book and were suddenly never the same. I don’t want you to forget those books because forgetting those books means forgetting why we read in the first place, and I don’t want anyone to ever forget that. I've still got much love for Nancy Drew, and I'm stoked that you put her on your list! Thanks for the great TTT prompt this week, guys! Ender's Game (and the spin off Shadow Series) and Harry Potter are my absolute favorites. I kinda don't think we need to worry about Potter and with the Ender's Game movie coming out soon I'm hoping that won't be forgotten either! I also have Harry Potter and Ender's Game on my list! I also love love HDM series... I even wrote my senior undergraduate thesis on it. <3 It didn't make my list. but SWOOOON. Harry Potter, Ender Game's, His Dark Materials and Narnia. Also, the wonderful Chrestomanci series by Dianna Wynne Jones, which I love, love and love again! Oh yeah, and, Foundation by Asimov, which is about the origin of modern science-fiction. I'm so glad someone else mentioned the Chrestomanci series!! It's one of my absolute favourites and I revisit it all the time! Great list! So with you on BBC and The Elements of Style. Oh, the Baby Sitters Club! I haven't read those in ages! I also think Goosebumps should be remembered, though I forgot to put them on mine! So many brilliant books get overshadowed. I used to be obsessed with The Babysitters Club when I was about 13 - I remember hunting through yard sales to see if I could find any that I didn't already have! I wouldn't want to read them again as it'd probably spoil the memory, but it's nice to think back about them! I adored Little House, Babysitter's Club, and Nancy Drew too! Amazing how many series I read when I was younger. Now it's pretty much just the Stephanie Plum series. I tend to gravitate toward stand-alones lately. Harry Potter made my top ten this week too. Ender's Game also has emotional ties for me. It was suggested to me by my first love. I still love this book even though he ended up hurting me. Great list! Harry Potter and BSC are great inclusions, I grew up reading both those series. Great list! 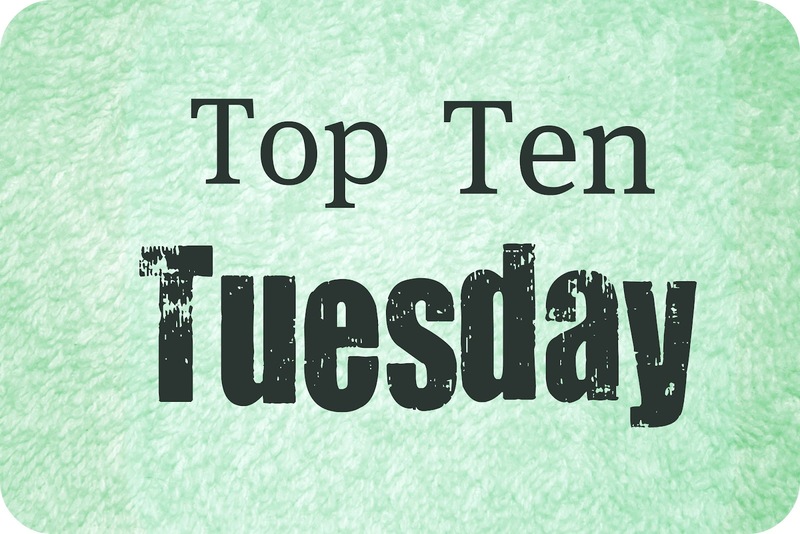 My first Top ten tuesday! I'm very excited to be a part of this awesome meme! I wholeheartedly agree about Harry Potter, Pride and Prejudice and Narnia; I'm as of now yet to read Enders Game, but this had made me want to read it all the sooner! We need to be the ones promoting those wonderful older books with younger people so the books are not forgotten. Thank you for the reminder! I also included the Babysitters Club! Looks like a lot of us will be making sure it isn't forgotten. :) My list is pretty random, so I'm looking forward to seeing if any of my other picks show up on others' lists! I love Little House too! I always liked how Laura wasn't perfect, it was easier to live up to. ;) And Pa with his fiddle. I still reread this series every winter. Great picks!! I love most of those series. I have Ender's Game on my list too! And yes forever to Chronicles of Narnia. They are magical and amazing and have so many things to say to children AND adults. LOVE THEM. Harry Potter of course <3 And I LOVE your last pick. You are so right about that. Thanks for sharing that :) it's the most important thing to remember. This is my first time of participating in your meme (about time too, ha) and I only made it to eight books *sob* but hey, give me a few more weeks and I'll get the full ten every time!! I grew up with the Nancy Drew books. I've been thinking lately that I should see what our library has in the series and re-read them. Harry Potter could never be forgotten, it's just too good! I put Pride and Prejudice on my list too. Gosh I love that book! I agree with others that this was very easy to write. I could have named twenty more. We share two - 1984 and Ender's Game. Thanks for the blog! I'm writing a lot more since I embraced these blog memes. Ah, you have so many great books on your list! I tried to go with hidden gems, but I agree with all of your selections (and I don't think they will ever be forgotten)! Number 10 may just be my favorite thing about this post. Because I think it's TOTALLY true. When you love a book, you shouldn't let it go or fall to the wayside or be forgotten. You should definitely keep it in mind and recommend to other people who might love it as much as you do! I kinda went with the classics on this one. I want to throw Freckle Juice by Judy Blume into the mix. It's the first chapter book I ever read (when I was six) and it sparked my love affair with reading. You could probably call it my "first true love"! If Harry Potter is ever forgotten, my future-self will be so sad. Definitely grew up with them the same way you did, and I can't imagine young readers not getting that experience. 1984 made my list too. That is a list of amazing books! This is such an amazinglist (especially because I've read most of the books/series on it)! First, I'm not sure anyone could or would ever forget about Harry Potter. I mean, sure there are fads but that series was just iconic. It makes me sad that I didn't have those books when I was a kid. I will say that TBSC, Narnia and Nancy Drew were staples of my youth. Even re-reading them now, I'm transported back to the carefree days of being a kid. There is so much wonder in those stories and that's what I love most about them. Great picks! Ah I didn't even think about Harry Potter, but I should have! I thought about the Little House series but did not add them to my top ten. I forgot all about the Nancy Drew books. I loved reading both of these. The Babysitters Club! I used to absolutely loved them! Great selection! But I really don't think you have to worry about any of those titles ever being forgotten! They are all already classics in their genres, even the BSC, which I was too old to read but my little sister read. Harry Potter is a definite! I want to read 1984. It is one of several classics I want to go back to read. For some strange reason I was never in the class that read the "usual" classics like the other classes. I think it was because I had the weird teachers. Great list! I loved Nancy Drew! I gobbled the books up but in my opinion, the original novels were the best! I was so surprised that Carolyn Keene was just a pseudonym for a bunch of woman writers when the series was first created. Pride and Prejudice is probably my favorite classic book, ever. Such a wonderful book! I loved Nancy Drew! Those books made my list. I love that you included the Babysitters Club books. I wanted to, but I limited "Older" to books that were published before I was born, and unfortunately the series was published mostly after that point. They were so good! love this feature! i will definitely be joining in the fun every week! you're list is perfect and i think i've got a lot of the same books on mine! I don't think many of these are in danger of being forgotten, but I love that you went the classic route. Hooray for Little House! I agree with your books, but I would also add the Anne of Green Gables series. It's wonderful. I haven't read Ender's Game, but I could have written the rest of your list myself, so now I'm definitely going to go check it out! I just remembered to link, oops! Excuse me while I go buy a copy of Elements of Style. Hi, my first time here, wandered by via Loni and thought this was a great idea! Oh, I LOVE your list. BSC forever! And you are so right about #10. Great topic! Maybe I'll pick it for a rewind since I didn't get around to it this week . . .
Nancy Drew is the beginning of my mystery and cozy passion!